We now know what lies ahead for Bernard Hopkins should he get past Beibut Shumenov on April 19, and it’s not the kind of 50th birthday bash “The Alien” was probably planning. 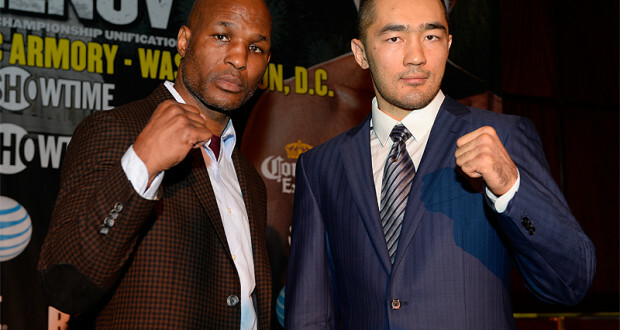 Hopkins, the 49-year-old IBF light-heavyweight champion, will fight WBA champ Shumenov to unify the titles. (Both boxers are Muslim.) Assuming he wins — and that’s the ever-confident Hopkins assuming he’ll win, not me — Hopkins had talked about defending the titles around his 50th birthday in January 2015, presumably in a potential send-off showcase against Russian knockout artist Sergey Kovalev or Canadian knockout artist Adonis Stevenson, the 2013 Fighter of the Year according to The Ring magazine. Instead, the winner of Hopkins-Shumenov will have to face Ukraine’s Anatoliy Dudchenko or France’s Nadjib Mohammedi, who will square off in June. The winner will be declared the IBF’s mandatory No. 1 contender. Both fighters are on hot streaks, with Dudchenko (19-2, 13 KOs) having won 16 in a row following back-to-back losses in 2007-08. Mohammedi (34-3, 20 KOs) has won 10 straight. Dudchenko’s original opponent was supposed to be Dmitry Sukhotsky (21-2, 16 KOs), who actually has a knockout victory over Mohammedi on his ledger, but he pulled out of the bout for undisclosed reasons.